1000 Shumway Ave Faribault, Minnesota. The candle-lighting service of remembrance is designed to meet the needs of parents, family, friends and professionals who have experienced the death of a child in pregnancy or from stillbirth, neonatal death, sudden infant death syndrome (SIDS), birth defects, illness, and all types of infant and early childhood death. "Parents who have had a child die have an especially difficult time during the holiday season," said Diana Sundwall, IRIS executive director. "They find it very difficult to be cheerful." "Parents never forget their children that have died. They may not mention them often, but they do not forget them," said Sundwall. "That's why we have people of all ages remembering their children during this service. For some, the child may have died yesterday, for others the child may have died 60 years ago." 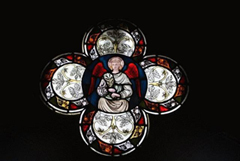 The service includes reading the children's names and the tolling of handbells and the chapel bells ring. Parents are welcome to light a candle in memory of their child and place that candle on the chapel altar, and parents, family and friends may participate in the service by reading poems, scripture, singing, etc. A reception following the service gives parents a chance to talk to others who understand how they feel, said Sundwall. View our scrapbooks to see more photos from the Holiday Service of Remembrance. Built in 1871, of local blue limestone with a rough quarry face except where it is used as trim around doors and windows. Rev. 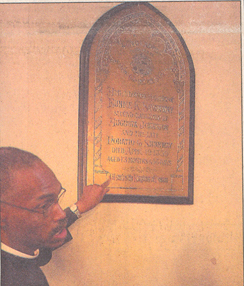 Henry Doyle, chaplain for Shattuck-St. Mary's School, explains the significance of the dedication plaque on the wall of the Shumway Memorial Chapel of the Good Shepherd. The full name for this very interesting building is the Eunice Shumway Memorial Chapel of the Good Shepherd. It was named after the daughter of Mrs. Augustus Shumway, Eunice K. Shumway, an infant who died on April 19, 1859, at the age of 13 months and 18 days. The Chapel of the Good Shepherd is the only building surviving from the old Shattuck campus. Construction began in June 1871 and was finished in September 1872. 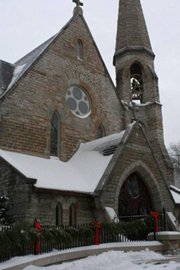 Although Mrs. Shumway suffered extensive property loss and some financial difficulties due to the great Chicago fire of October 1871, she stood by her pledge of $20,000 to build the chapel. It was designed by the noted New York architect Henry M. Congdon. Total cost of construction was about $30,000. 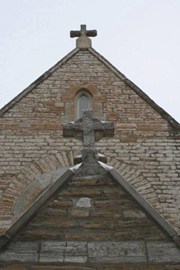 It is in the English Gothic (once called Pointed Gothic) style, built of local blue limestone with a rough quarry face except where it is used as trim around doors and windows. 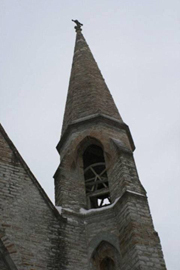 The chapel has two remarkable and unusual features: first, the bell tower and steeple are constructed entirely of quarry-dressed stone, conical in shape, but appearing light and delicate without the heaviness that stone can convey; second, the seating in the chapel faces the center aisle rather than toward the front. The floor tile, pulpit, lectern and stained glass windows were manufactured in England.